Watch Winders are handy tools that help keep automatic watches properly wound for long periods of not being used. They are great accessories to have that keeps the watch correctly in tune with the time and are classy decorations that elegantly shows off your beloved timepiece. In this article, we’ll talk about the best watch winder brands currently available. These selected few are tried and tested brands that are the usual go-to places when in need of a reliable, quality watch winder. In this fast-paced world where we are either too busy or don’t have much to do, it’s hard to constantly keep automatic watches wound up through everyday use. Oftentimes, several days of non-use requires a quick winding up of the timepiece, eating up valuable minutes especially when in a hurry. The beauty of watch winders, aside from its usual sleek appearance, is the convenience it provides for people who don’t have enough time to manually wind up lost time or for those who don’t regularly use these types of watches enough to keep it in proper condition. It can also be used to showcase the beauty of your timepiece as a unique display by itself or with a few more beloved watches along with it. One of the most popular and basic watch winders available in the market, Versa is oftentimes a go-to brand when in need of an entry-level winder. Because of its affordability and reliability when it comes to movement and protection, it’s definitely no wonder that the watch-winding brand is popular amongst owners of automatic watches. Due to its affordability, one might start to judge the quality of its motors. This is far from the truth, as Versa utilizes innovative technologies from Japanese Mabuchi motors that ensure high-quality winding with low levels of noise during operation. It meets high quality standards while remaining attainable for most automatic watch owners minus high price tags from other prestigious watch-winding brands. The design of Versa watch winders is fitting for most automatic watches. They are sleek and usually contemporary, highlighting a modern look and feel for your precious timepiece. Soft, black interior pillows encapsulate your watch as it is being wound up inside the watch winder. The Versa watch winder is available in different storage compartments, ranging from Single, Double, and Quad. These are the usual basic compartments present in watch winders. If you are looking for a winder that is reliable in its movement, with a very reasonable price tag, then the Versa might just be the watch winder for you. 100% handmade and one of the most aesthetically-pleasing in design, Chiyoda offers minimalist beauty and functionality all packed in a watch winder. 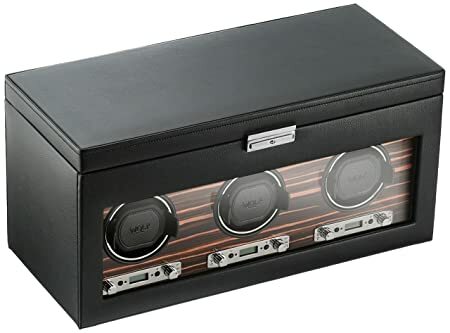 A distinguishable and elegant winder, the brand is very popular for its classy style that piques the interest of those who want a simple, yet striking watch winder. The glossy look and finish of the handmade Chiyoda watch winder perfectly sums up the quality and beauty of the equipment. Undoubtedly, at first glance, it seems to be quite the expensive winder. Fear not, though, as this is also an affordable watch winder. Competitively priced with quality craftsmanship and innovative rotation, Chiyoda makes a great bargain as one that fits all your winding needs. A Mabuchi Belt Driven motor operates the winder of the Chiyoda. This ensures a smooth and relatively noiseless operation. An adjustable band allows various sizes to fit one winder, effectively accommodating most timepiece sizes. Insulated velvet masks the interior to protect your timepiece against magnetization from outside forces. Chiyoda has several available slot compartment sizes. 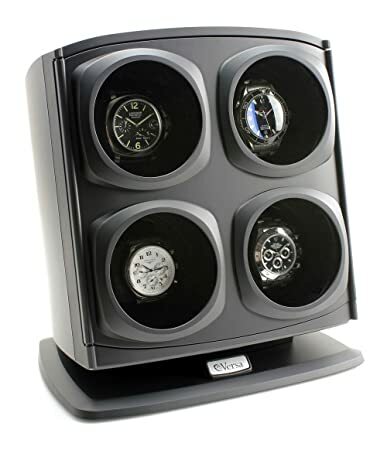 The watch winder ranges from Single, Double, or Quad winders. Given its price range and quality craftsmanship, it rightfully deserves its popularity and reputation as a trusted and beautiful watch winder. 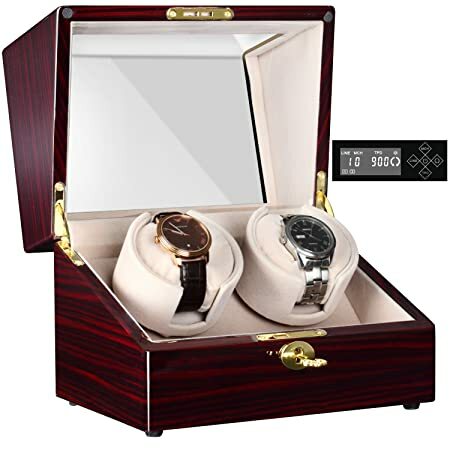 A highly popular higher-end ranged watch winder, Orbita is another famous brand for watch winders. 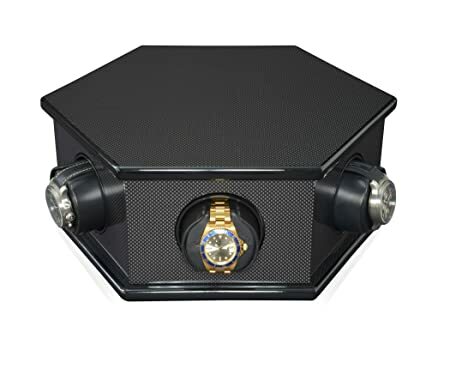 Though a relatively young company, they have already paved various leaps in the technologies of winders, earning their place as a highly reputable and trusted quality watch winder-making brand. Offering multiple designs, Orbita ranges in its beauty with classy polished wood for some of its pieces while also offering leather covered watch winders for a sleek and formal-looking design. Their selections provide the perfect look for almost any automatic timepiece you have, giving them the perfect winder and compartment when not in use. Patented rotorwind motors make up the winding mechanism of Orbita. Priding itself in its innovations, the company offers a more natural feel for its winding as they imitate the movement of the wrist, instead of normally rotating the watch. This attention to detail makes their winders a quality investment for their thought in design and functionality. Orbita’s watch winders come in several different compartment options, ranging from Single, Double, Triple, Quad, 6-piece, 9-piece, 12-piece watch winders. This selection is more than enough to showcase and wind your beloved timepieces. For the more serious and avid collector, watch winders with compartments reaching, 24, 36, and 48 are available. All of which offer a more serious protection while keeping your timepiece properly wound up. The customizability of their watch winders can also be made upon request, highlighting your creativity through their innovations. On the higher end of the price range is the premier watch-winding brand, Wolf, which is definitely one of the most trusted brands in the market. Speaking for itself is its rich history and popularity amongst watch enthusiasts who own watch-winding equipments. Tracing its roots in 1834, the company started with German silversmith Phillip Wolf. He discovered that silver pieces sold more when presented in beautiful boxes, thus he invested in the craft and design of the containers which protected and encapsulated various pieces, from his silverwares to jewelry. A few generations more have succeeded in entering the watch winding market with beauty and functionality in mind. Nowadays, WOLF has become a popular name when it comes to watch winders. Their passion for designing beautiful and intricate boxes, coupled with the introduction of innovative winding mechanisms, has made their watch winders trusted, reliable, and surely one you won’t regret buying for your timepiece. Their usual available winders range from Single, Double, Triple, Quad, 6-piece, and 8-piece watch winders. You can choose from their collection depending on the quantity you have and the design you opt for your timepiece. If you are seriously considering a high-level protection for your watches that keeps your pieces secure while being wound up, you can opt for their innovative 24-piece or their 32-piece watch cabinet winder that both winds and protects your beloved timepieces. Depending on your choice, these brands Versa, Chiyoda, Orbita, and Wolf are definitely the most popular and reliable watch winders. Varying in different price ranges and designs, their reputation and trustworthiness as brands is an insurance of their reliability in winding your beloved watches while being aesthetically pleasing on their own. The final choice depends on you. Your considerations may range on the budget, number of compartments and storage, design, and the overall fit and feel the winder would have when integrated with your timepiece. There really is no wrong choice here. All of them have their pros and cons, but their basic reliability as a winder is undoubtedly reputable.